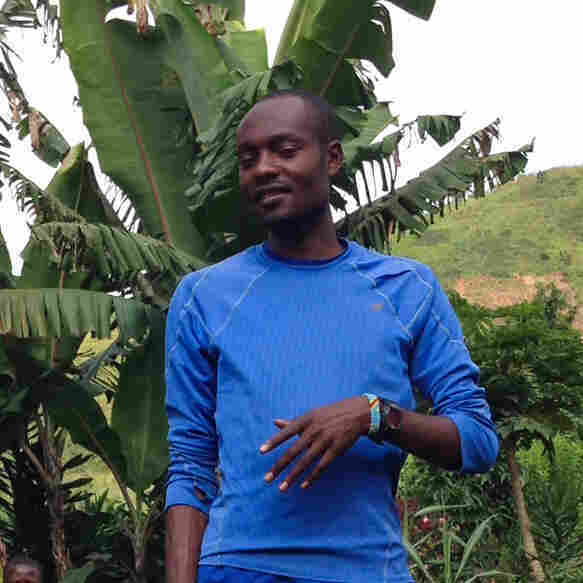 Olympic Marathoner Starts Running Club For The Youth Of The Democratic Republic Of Congo : Goats and Soda They joined a club started by an Olympic marathoner. They've learned to push through the pain. They get their school fees paid. And one of them is fast enough to join her mentor in Rio. The runners in Project Kirotshe take off through forested mountains. For participating in the club, they each get a stipend to pay school fees. Beatrice Kamuchanga, 19, a humble and soft-spoken girl from the small eastern village of Kirotshe, will represent Congo in the 5,000 meter race in the 2016 Olympics in Rio de Janeiro. But for her, running isn't just about aiming for Olympic glory. "Running gives us the energy to study even when there is not food to eat," she says. "And with God, and as a group, we can continue to succeed together." Beatrice Kamuchanga, 19, will be running in Rio for the Democratic Republic of Congo team. The group she's talking about is called Project Kirotshe, created in 2012 to help Kamuchanga and her peers grow strong physically but also overcome the enormous challenges of everyday life for youth in eastern Congo. "If it's hard, it's worth doing," says Makorobondo "Dee" Salukombo, her 27-year-old coach and a fellow Olympian — he's running in the marathon. "It's not easy. That's the way of running." Since 1996, a series of wars and conflicts has taken large tolls on communities in Congo, causing rampant unemployment and poverty. Government forces have struggled to maintain control in the eastern part of the country and continue to battle various rebel groups in the region. Many young people can neither find work nor afford to pay school fees and so they are easily recruited by rebel groups, militias, or gangs of street kids, explains Musabya Kabatsi Zachée, principal of Kirotshe's secondary school. "Even today there are armed groups that destabilize the region," he says. "There is a great risk of youth joining armed groups without school." Zachée sits in his office, once occupied by the Congolese army during a rebel takeover of nearby Goma from 2012 to 2013. He reminisces about the time before war when the residents of Kirotshe were able to support themselves through trade and farming. Dee, the founder and coach of Project Kirotshe, was born in Kirotshe before war broke out and remained in Congo until 2000, when his mother and father were forced to flee to neighboring Uganda. After four years as a refugee, the family resettled in the United States. In 2012, after graduating from Denison University in the United States, Dee returned to Congo and began Project Kirotshe. "For me, being a refugee was the greatest lesson of my life; I got a second chance at life," says Dee. "So why not give that chance back to someone who could go even further." 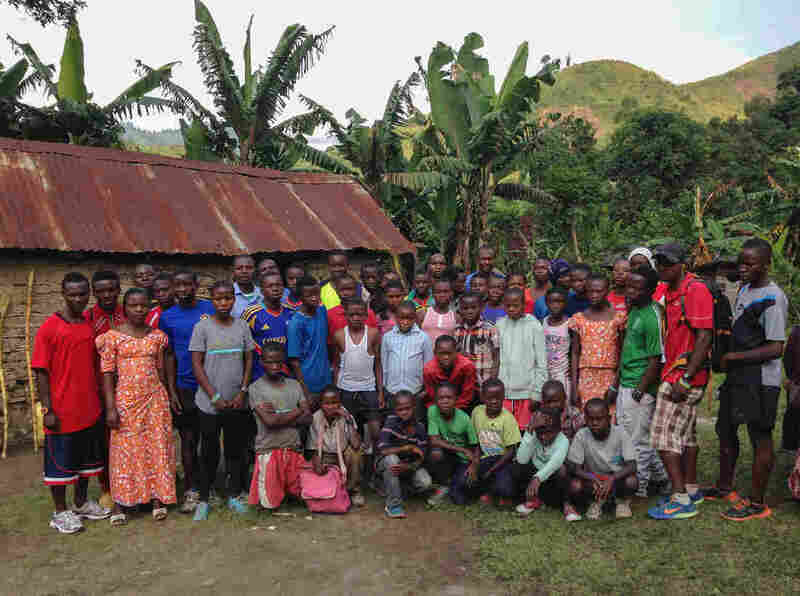 He returned to Congo with a vision of helping the youth in Kirotshe stay in school and participate in a running team, much like the cross-country and track teams he'd joined at school. "Running has been such a big part of my life and has helped make me who I am today," says Dee. He hopes that running will enable the youth in Kirotshe to learn important lessons about leadership, hard work and being a member of a team. "The first time Dee came back was very exciting," says Baraka Nyamutera, 23, a runner on the team. "Before he came back, I had never even thought of running. When he returned [to Kirotshe in 2012] we went to see him run and were inspired to start training ourselves." But the project isn't just about running. With families in Congo struggling just to put food on the table, many can't afford the annual $35 for primary school fees and $75 for secondary school. And so, Project Kirotshe raises money in the U.S. to pay these fees for the kids who take part in the running club. The runners of Project Kirotshe, ages 10 to 23, train practically every day. "This year we were able to pay [the school fees] for 53 kids," said Dee, "and next year our goal is to help at least 100." Before the start of Project Kirotshe, many students believed it was only a matter of time before their parents would no longer be able to pay the fees and they would be kicked out of the school. That uncertainty caused many students to neglect their studies, says Justin Kandundao Shabapfuku, director of the primary school in Kirotshe. "They [the runners] have a different mindset now," he says. "They believe the money will be there and they will have the ability to succeed." Thanks to Project Kirotshe, Nyamutera was able to graduate from secondary school and now is a pre-med student at a local university. "Dee gives us guidance and courage to keep running when life is difficult," says Nyamutera. Not only does Project Kirotshe provide runners stability in their studies, but the running team gives the youth a sense of purpose, says Fiston Sadiki, the team captain. Sadiki, 25, often talks to the team about his experience to help motivate the runners to stay in school and focus on creating a better future. He married young, dropped out of school and had children. He now struggles to make $1.50 a day to support his wife and two children, living in a home he built with his own hands. When he is not working, Sadiki volunteers to mentor and train with the runners. "We believe we can be among the best runners in the world, so that we can represent the Democratic Republic of Congo, so we can make a lasting change in our country and community," says Sadiki. Salvador Muyala Kiverwa, president of the League of Athletes in the North Kivu Province of Congo, met Dee this March after hearing about Project Kirotshe. Kiverwa, who works to raise financial and community support for athletic programs in the province, was impressed by the accomplishments of Dee and the young runners. "We have a vision of athletics in our province, and the project [Project Kirotshe] brings pride," says Kiverwa. Although Dee started the running project to help students afford school tuition, he had another vision: "The goal was to try to send at least one runner to the Olympics." His vision became a reality when Kamuchanga qualified to compete in Rio de Janeiro. "For her, at first she wasn't the best runner. It took time and training," Dee says. "But she can take the pain and she wanted to be the best." During the years of war, Kamuchanga's mother, Kayindo Ngandu, and father, Mwanuka Kamuchanga, had their land stolen and fell into extreme poverty. A great deal of responsibility fell on Kamuchanga to care for her household — cooking, cleaning and fetching water — while her parents worked on farms to earn enough money to buy food. 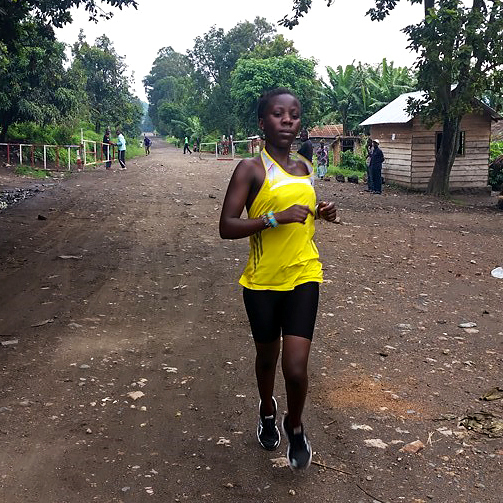 Along with running in the Olympics, Kamuchanga dreams of attending university and hopes her appearance in the 2016 Games might help her secure a scholarship. The runners aren't just helping themselves. "They [the runners] set a good example for other kids in the community," says Kanyabugoyi Nyamutera, father of Baraka Nyamutera, "and the running team teaches them how to live in society and interact with others." The runners of Project Kirotshe represent their community in regional races throughout eastern Africa, where they build confidence as well as pride in their nation. "When we travel to other places, neighboring countries learn who we are and we represent our community," says Ushindi Kamuchanga, 17, Beatrice's young brother who is also a member of the team. And even as the Olympic races take place, the runners back home will be running for their own sake. 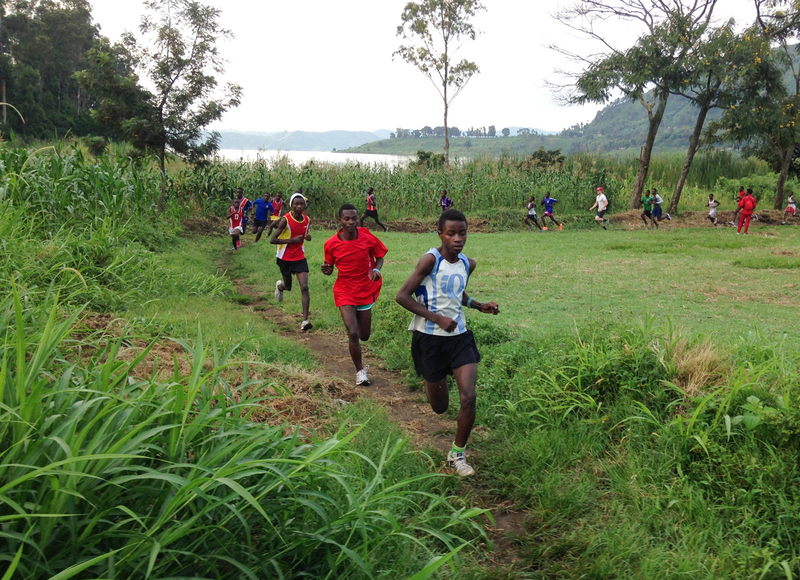 On a recent May morning, the sun was still coming up over Lake Kivu as a team of young runners between the ages of 10 and 23 stretched and chose routes for their morning run. They gathered in the center of Kirotshe, a village on the shore of Lake Kivu, to train in forested mountains just outside of town as they have every day for nearly four years. The students dart quickly up the steep winding trails as they push one another to run faster. Once at the top of a small mountain, they take a minute to look out across Lake Kivu and catch their breath. After the morning practice, Dee walks down the road back to his grandmother's house, greeting passers-by. "To me, these past four years are a miracle," he says. "I knew that God had a plan for me to come back here." And even with his Olympic goals, he isn't giving up on Project Kirotshe. "I just need to keep running," he says. "I just need to keep running for those kids." This story was produced with help from the Pulitzer Center on Crisis Reporting. To read more about youth in Congo, see Daniel Socha's story on Beatrice Kamuchanga, who is on the country's Olympic team.